I know everyone is busy with holiday preparation, so just a few words about some bees I saw in June. I've seen this bee before -- it's Bombus fervidus, commonly called the golden northern bumble bee -- but it has always managed to fly away before I could take a photograph. I snuck up on this one while its head was deep inside a wild bergamot blossom. See all the furry yellow stripes on its abdomen? Click to enlarge. 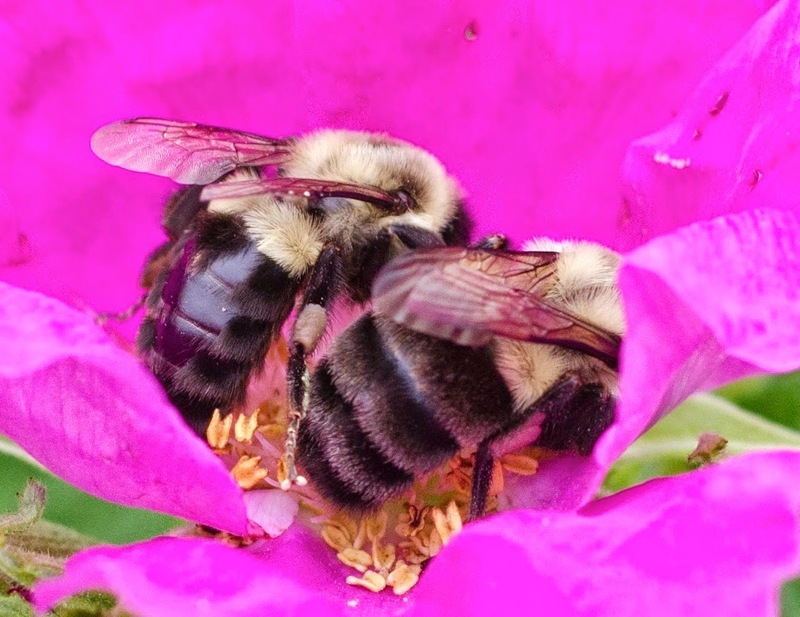 The bumblebees I usually see are these common eastern bumblebees, Bombus impatiens. Note the black abdomens and short yellow jackets. I saw all the bees in this blog post in Brooklyn Heights. I also sometimes see brown-belted bumblebees, Bombus griseocollis, like this one. Note the "hip-length" furry jacket. The golden northern bumblebee again -- I'd call that a "knee-length" yellow fur coat if bees had their knees where ours are.